Well I'd love to tell you I won the recent massive lottery, or that a huge bag of money fell out of the sky into my backyard. But my good fortune has nothing to do with daydreams of sudden wealth. Now that I have your attention lets talk about a new mystery quilt along called Good Fortune. The hostess is Bonnie Hunter of Quiltville. Most of my followers know Bonnie but for those of you that are new to the quilting world let me tell you a little about her. Bonnie a super talented quilt designer that breaks all the rules. She rarely drops fabric manufacturer names, she doesn't lead you astray on new gimmicky notions or products. She will however help you in your quest to make beautiful quilts from whatever fabric you have on hand. Her most famous books that put her on the map with quilters all over the world were about cutting up men's shirts purchased at thrifts shops....and yes...making quilts out of them! 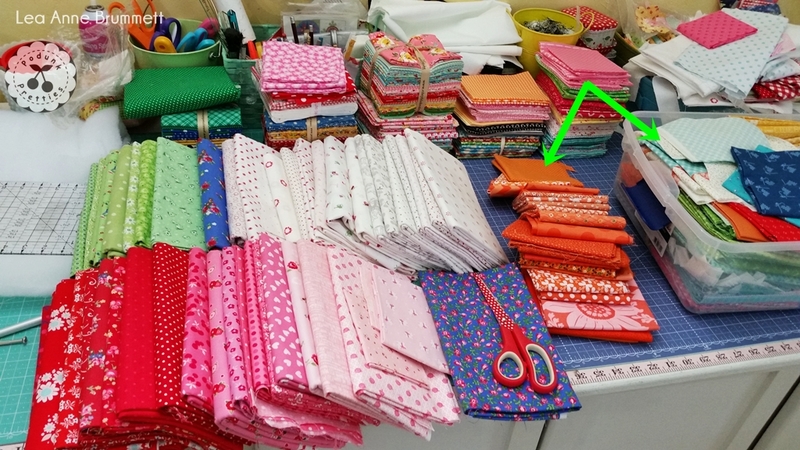 She also has developed a scrap saving system that makes scrap quilting easy(if you apply it). 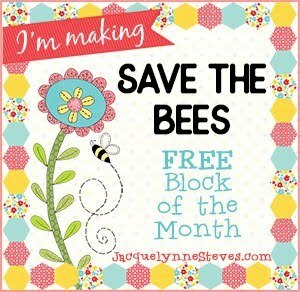 Click here and Here to read about the best scrap system ever. 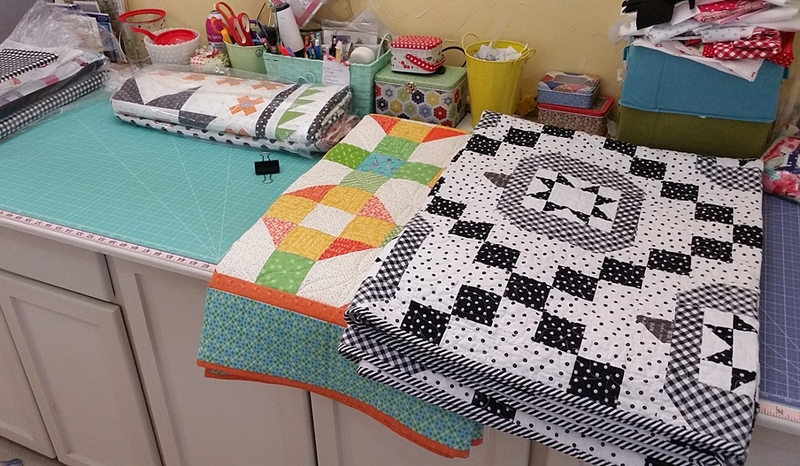 Bonnie's tutorial for cutting fabrics correctly change my quilty life, check it out here. After you catch the Bonnie Bug you also might want to look at her free patterns page here. Make sure you go all the way to the bottom for clues to past mystery quilts still available for free. It will give you an idea of how this years mystery will play out and weather or not you'd like to join the fun. Back to the Mystery quilt along. It's a yearly event, I say event because thousands of quilters make these quilts every year. Quilt shops put together bundles of fabric for the mystery. And Lowe's hardware has been known to get kinda mad at quilters taking too many paint cards. Bonnie finds paint cards to match the colors she used in the quilt. She even tells you what numbers are on the cards. Quiltville's Open Studio on Facebook is where all the Bonnie stalkers hang out, waiting patiently all year for the next set of clues. Joining the group is a must, there's so much going on all year long. A couple of years ago I played along with the mystery. It took a year or more for me to finish. Not because it was a hard quilt to make, but because that's how I roll! My finished En Provence Mystery quilt can be seen here. The introduction for this year quilt, Good Fortune, was released on Halloween. The colors are a little more in my color pallet than in past years. The one mystery I did make I changed the colors. And by the looks of these oranges there may be a change this year also. Two of my latest quilts have had orange in them. 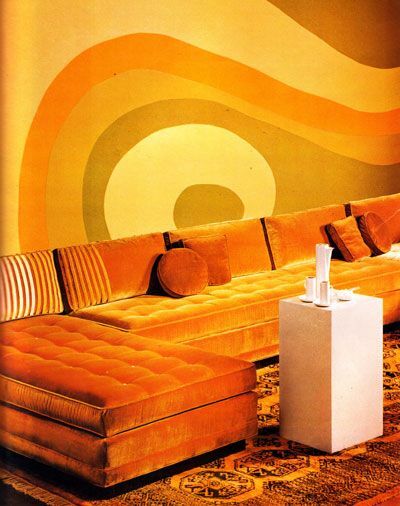 I was looking forward to putting those orange fabrics back on the shelf. I'm starting to feel like my home is wrapped in orange. I can do this, just one more quilt with orange. So I started pulling fabric from the yardage and fat quarters. Plenty of orange, red and green. But lacking blues and loving the pinks with the reds. Since pulling from fat quarters and yardage didn't produce the needed colors I decided to pull out the scraps. Now let me say I love Bonnie's scrap saver system. It looks amazing and I'm sure it works well. In order for it work you must apply it to your scraps....I do not. Why? 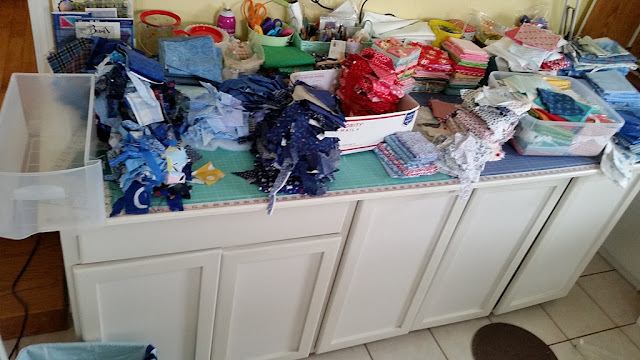 Phobia #158...cutting scraps then needing a different size. Yes that's right, I'm afraid to cut fabrics that rarely see the light of day. Well they aired out really well a couple of days ago. The pictures are blurry but who needs to see a mess clearly. 9 AM Thursday total chaos. 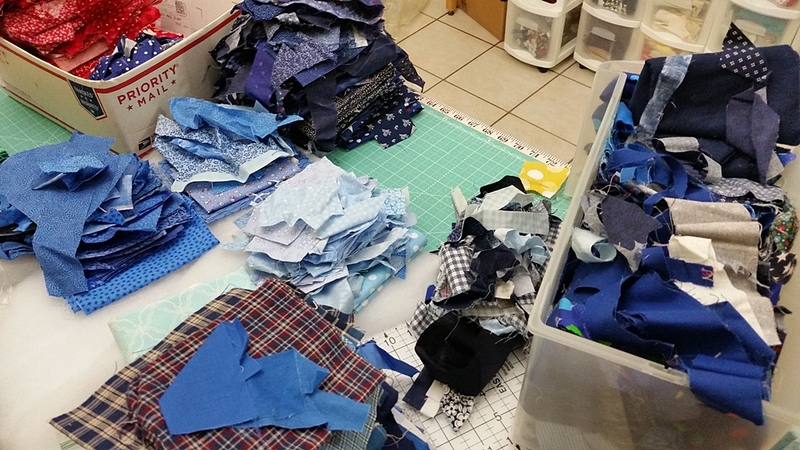 The feeling came over me to throw all of my blue scraps in the trash. What a mess! So I quickly put them all back in the scrap bins. 9 AM Friday- all was back to normal, new fabric was ordered to make up for my lack of colors in larger more uniform pieces. The scrap bins are a job for another day. 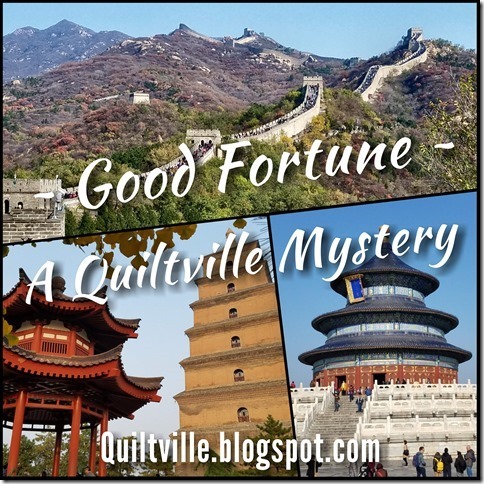 Are you making the Good Fortune Mystery quilt? Are you changing the colors? OK, so I expect to see you take the bull by the horns and tackle those blue scraps. Just think of the joy you'll feel when they are shaped up and lovely. BTW, your picture of the fabrics you'll use for Good Fortune is wonderful - as I'm sure the quilt will be. I'm going to participate but I am going to change the colors! I used orange rather than coral in my ORL last year, so I am going to use aqua/light blue instead of orange in my GF quilt. I'm keeping the other colors the same. I think I am going to start out half sized and see how far my scraps take me! The colors do not appeal to me, so I am waiting to see how it starts and if I can change to the palette I already have grouped for a possible project. I'm excited about the Good Fortune mystery. This will be my third Bonnie Hunter mystery. I enjoy every step of the mystery but especially like gathering up the fabrics required from my stash. Bonnie's instructions are great and I learn so much from her. I plan on basically following the colour pallet with some changes to bright blue and green. Can't wait to get started. 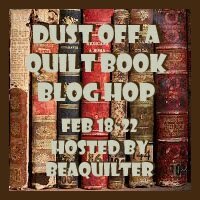 i only have 30 min for lunch and this post was overwhelming... :) :) i will need to go back and reread and check out the post for the quilt along. I'm already participating in a couple and need to prepare for the holidays. I'm so excited..but need to be sure what i'm going to do. thanks!